There is nothing like the gleeful celebration after a big win. You want to cheer loudly, chant boldly and storm the field like a bunch of rabid kids searching for a can to kick. 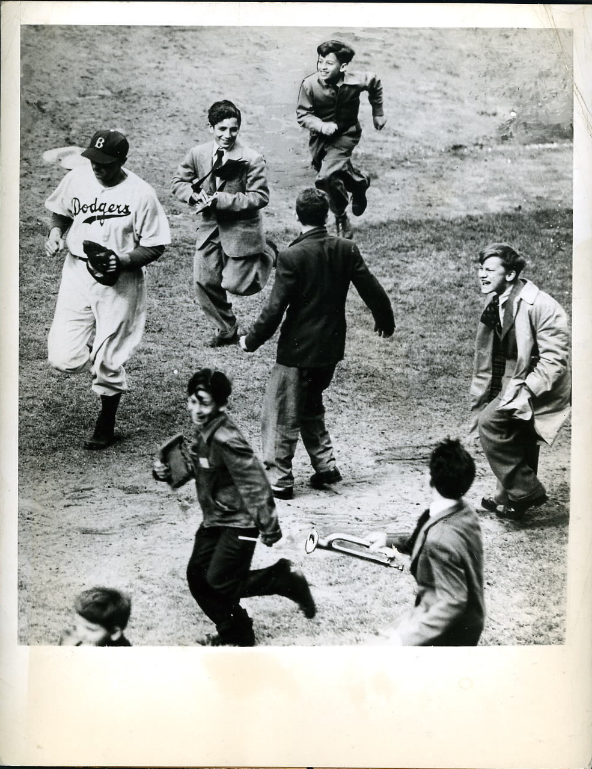 Young Brooklyn Dodger fans are chasing Dixie Walker as the "Peepul's cherce" legs it for the dugout after the end of yesterday's game against the Giants. Walker added to his popularity with the flatbushers by striking the blow that humbled the New Yorkers 4-3. He belted out a homer that netted three runs in the 8th inning. Ken Rosenthal at FoxSports shares his recent interview with Jimmy Rollins. We had that meeting, and they were talking about all those things. When I chose the Dodgers as a team to go to, I wanted a team that had history. The Phillies have been around for a long, long time (dating to 1883). They weren’t -- and I use the term lightly – a “pop-up franchise.” They were part of the original makeup of baseball. New signee Pablo Millan Fernandez said the following about signing with the Dodgers, via Jesse Sanchez at MLB.com. "It's a great privilege to sign with such a great team like the Dodgers," Fernandez told MLB.com in a phone interview from the Dominican Republic. "I've always liked the Dodgers, even back when I never even imagined playing at that level. I'm ready to do what they want me to do. I know there are still things to learn." JP Hoornstra at Inside the Dodgers shares some comments from Alex Guerrero on fellow Cuban Pablo Millan Fernandez. Here's some Baseball business news. Via Darren Heitner at Forbes, "Louisville Slugger To Be Acquired For $70 Million" by Wilson Sporting Goods. Welcome to the Blue, Hector Olivera!